This new UG802 Android Mini PC might prove to account for a nice purchase, as it may fall into a new, improved wave -maybe to be seen as a second generation- of Android based mini computers. Manufactured as OEM Brand by some Chinese anonymous source, this particular Android mini pc is being marketed as “UG802” model which proves to be a suitable string for you to search inside the usual chinese online stores. The UG802 form factor is just a pinch bigger than an old USB pendrive, including inside a plethora of goodies. The plastic casing portrays a whole bunch of heat venting holes, evenly distributed. According to different sources this seems to be enough for coping with the heat problem that other, earlier models of Android Mini PC, got . On one end of the UG802 we can find a full size HDMI connector which will let you plug this Android mini PC directly into your TV. It also includes an USB OTG port where you can plug an USB hub with an USB mouse and keyboard, along with other USB devices, and a micro USB port for you to gain access into the included storage memory and also give power juice to your UG802. The UG802 Android mini PC runs Android 4.0.3 Ice Cream Sandwich out of the box, but some distributors are reportedly testing Android 4.1 Jelly Bean on it too. On the hardware side, this Android mini PC got 1 gb of ram, 4Gb of storage memory, a dual core Rockchip RK3066 Cortex A9 processor and a MaLi 400 graphics co-processor. It also includes a microSD card slot for you to increase it’s storage capacity and a WIFI 802.11N network adapter. 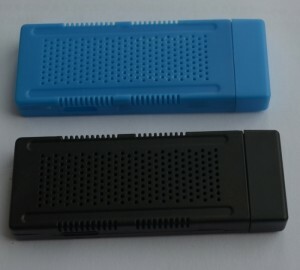 This Android based mini computer is perfectly capable to cope with any app and game from Google Play Store and other sources, including the famed XBMC media player. Our opinion about this Android Mini PC tends to fall into a favorable side but yet we may recommend you to wait a couple of weeks until early users start reporting that the heat problem is fixed indeed with the provided venting holes. Got one in w2comp for just 85! I get mine from in4dealz, the heat problem is better a lot then the MK802. Dont buy the UG802, Get the new 808 that just came out! UG802 was a flop, very fast compared to the MK802 but the Wifi will not pick up more then 8 ft away..The 808 is the way to go. I got from w2comp and I found that no wifi problem. Working great! !